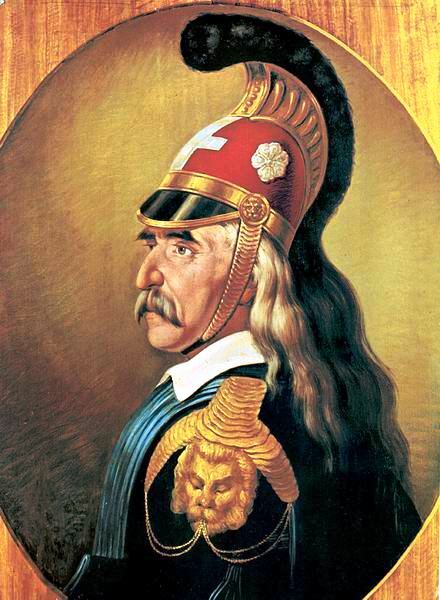 Theodoros Kolokotronis was one of the leaders of the Greek War of Independence against the Ottoman Empire. He was born in Ramavouni, Messenia and wasraised in Libovitsi, Arcadia. Kolokotronis, along with his two brothers, joined the Peloponnesian guerrilla band when he was only 15. In 1805 he took part in the Russo-Turkish war, where he gained valuable experience at sea. His first battle against the Ottoman Empire was atValtetsi, a village near Tripoli. In 1821, before the outbreak of the war, Kolokotronis created a klepht band of people attempting to organize them into an army of soldiers. This was an army of Greeks who had knives as weapons and very few carried guns. They were mostly inexperienced because they were slaves during the Ottoman occupation and had no right to have weapons or ride horses. Then on April 24, 1821 Kehayabey Mustafa, commander of the Ottoman garrison, set out to stop Kolokotronis with his armed force of 12,000 men against 2,300 revolutionaries. Kolokotronis entered battle with his 700 troops and together they repelled the Ottoman army, who retreated, and were victorious. This was the first decisive Greek victory during the war and helped to strengthen Greek morale and self-confidence. His greatest success was the defeat of the Ottoman army under Mahmud Dramali Pasha at Dervenakia in 1822. He started the campaign in Nafplio leading an army of Greek soldiers against Dramali and his Turkish troops, who occupied the acropolis. Dramali and his troops eventually retreated and were hoping to reach Corinth by taking the Dervenaki Pass. It was here that the Greek forces successfully defeated the Ottomans. Kolokotronis would then return to Nafplio and finally captured the fortress in December, 1822. It was said that Kolokotronis rode his horse up the slopes of the Kastro Palamidi to celebrate his victory in Nafplio. In 1825 he was appointed commander-in-chief of the Greek forces in the Peloponnese. After the war, Kolokotronis became involved in the politics of Greece for the next ten years until his death in 1843 in Athens one day after his son’s Konstantinos wedding. Today Kolokotronis is among the most revered of the protagonists of the War of Independence and is a national hero in Greece.